We are blessed to have an amazing team and consider it a privilege to serve as part-time or full-time staff. We are regularly seeking individuals to help us fulfill our mission and advance the Kingdom of God. Intentionally ordering our lives under our Rule of Life/Pastoral Rule of Life. Seeing and living out the connection between our personal formation and our work performance (soul and role). Leading out of our marriage or singleness. Choosing to be a life-long learner, developing our area of leadership. A growing fluency in Emotionally Healthy language, skills, practices, and concepts. Listening well, seeking first to understand before being understood. Speaking clearly, directly, honestly, respectfully, and in a timely manner. Supporting each other by acting for the good of our whole church with the fulfillment of our mission in mind, no matter what our position. Speaking up about elephants in the room. Celebrating, appreciating, and spotlighting other ministries. Respectfully approaching people about concerns and puzzling issues. Taking the time to offer high-quality work in all that we do (teaching, design, counseling, communications). Taking initiative to solve problems that we see. Regularly mobilizing others to serve and lead within our community. Taking responsibility for our decisions and actions and learning from our mistakes. Autonomy: Empowering others and trusting them to make important decisions on behalf of the organization. Giving others the freedom to fail and make mistakes. Mastery: Working to create an environment where everyone can grow in their gifts and skills and thrive at the very top of their potential. Purpose: Dreaming big–dreaming God’s dreams for our community–and empowering others to do the same. Fun: Creating fun, loose, and celebratory environments. Excited about joining our team? 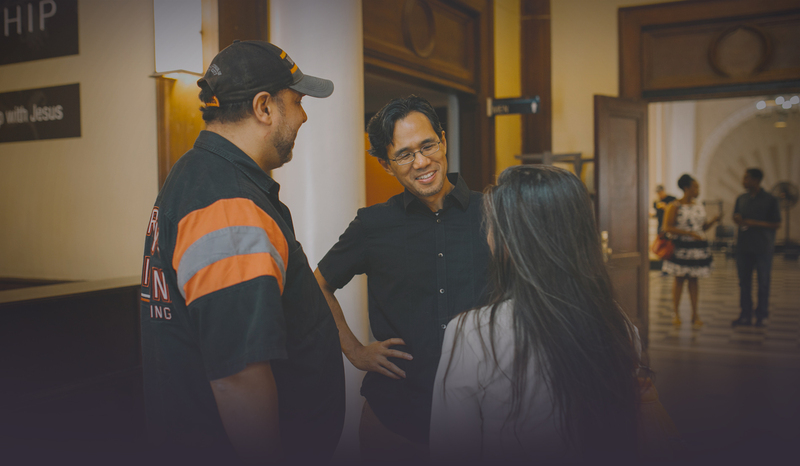 The Assistant Pastor will oversee the Pathway, lead the New Life School of Theology, perform regular pastoral duties, and serve in our outreach efforts toward a diverse mix of people in Queens. 1. Oversee Pathway: including Alpha, Baptism, Newcomers’ Lunch, Communitas (Membership); Christian Foundations classes; leading a table at the EHD Course; *providing pastoral direction for EHD tables and table leaders. 2. New Life School of Theology: including *supporting a cohort of New Life members being equipped for greater leadership responsibility; planning mid-sized equipping classes (with Lead Pastor) and overseeing the process. 3. General Pastoral and Staff: including attending appropriate staff meetings; creating sermon based questions; being an active presence in the lobby each week on Sunday’s after all three services; overseeing four (4) Congregational Day Alone with God (DAWG) retreats per year; overseeing four (4) evangelism equipping classes per year; performing general pastoral duties as required by all pastoral staff (weddings, funerals, etc. ); *preaching on Sundays is subject to level of experience and skill. Lead a team in the continued development and growth of a strong small group ministry, fostering the importance of connection and biblical community through vision casting, identifying, equipping and releasing small group leaders. 1. Identify, equip and release 10 new small group leaders per year: focusing on Neighborhood Groups, training new and existing small group leaders, leading a small group for the purpose of multiplication, and starting new groups from summer parties. 2. Connect with small group leaders: being a Sunday lobby presence; making monthly connections via phone, email, lunches, visiting groups, etc. ; overseeing coaches, apprentices and small group event summaries. 4. Supporting Pathway events, including Communitas and EHD classes. 5. Performing general pastoral duties: attending appropriate staff meetings; being an active presence in the lobby each week on Sunday’s after all three services; general pastoral duties as required by all pastoral staff (weddings, funerals, etc.). In 8 years, New Life CDC has more than tripled its budget as the organization has continued to serve the local Elmhurst and Corona community and Queens. Neighborhood impact has also grown with most recent recognition from NY City Council and the Queens Borough President… In its 25th year of operation, the organization is looking to position itself for greater impact and empowerment of its guests, volunteers and partners. Included in this strategic positioning is the establishment of the Director of Development role. Work with the Executive Director to ensure financial sustainability of the direction of the organization as set by the Executive Director and the Board of Directors. In coordination with the Executive Director, articulate the vision, mission and direction of the organization. Design and execute a sustainable short term and long term development plan. Design and execute a program to grow number of individual donors and maintain relationships through updates, thank you’s and gifts. Execute the hosting of an annual fundraising gala with net proceeds of at least $100,000. Hire and evaluate development staff as required. Provide a quarterly report of financial health of the organization and progress of the development plan. Provide financial reporting as needed or as requested by the Executive Director. The primary role of the Grant Writer is to secure grant funding for Success Groups project expenses. The secondary role is to assist the Executive Director in strengthening the marketing and fundraising models of the Success Groups project. The New Life CDC Success Groups (SG) project empowers families to rise out of poverty while leveraging the power of community. It is based on the Family Independence Initiative (FII) model of economic mobility found in 7 U.S. cities. Success Groups launched in NYC in 2016 and is proving to be a responsible and sustainable model for the empowerment of low-income families in urban settings. The project is data-driven, community-oriented and financially efficient. This role could be a part-time or full-time position. Success Groups is a project based on a model found in 7 other U.S. Cities and initiated by the Family Independence Initiative. The Success Groups project releases funding to individuals and families as a means of empowering them to overcome financial and professional challenges. The Success Groups Liason serves as the New Life CDC staff representative to the Success Groups families. This position is part-time employment at 8 to 15 hours per week. Training is provided. 1. Success Groups staff MUST refrain from instructing families on how to plan for or achieve goals (financial, educational, health, etc.). Violation of this requirement is possible grounds for termination. 2. Lead/ execute info sessions until the desired number of cohorts is formed. 3. Attend cohort meetings in order to take detailed notes. 4. Perform quarterly audits to ensure correct data and capture goals of cohort members. 5. Be well versed in Success Groups/ FII technology especially journaling and analytics. 6. Be well versed in Resource Hub processes. 7. Other tasks required to fulfill responsibilities. The Director will execute mission and vision of our New Life Community Development Center’s (New Life CDC) Booster Club After-school program. Employment is 20-25 hours per week. 1. Grow student enrollment from 18 to 25 students while maintaining quality programming. 2. Lead marketing effort at local schools including PS102 and PS7. 3. Set up monthly curriculum for whole school year. 4. Oversee inventory/procurement of supplies and materials required for program. 5. Recruit, train, manage staff of paid staff and volunteers to ensure quality programming. 6. Organize student information: applications, report cards, etc. time, homework help, instructional time, dismissal. 8. Ensure proper processing of payments and management of program budget. 9. Keep parents informed of relevant program information. 10. Assist Executive Director in fundraising efforts. 11. May be required to attend New Life CDC program head meetings and NLF staff meetings. Our Leadership Residencies provide opportunities for personal spiritual formation and leadership development. The end goal is to train and develop emerging “5 Ms” leaders in soul and role, through our formation pathway (connect. grow. serve), and to release them to steward their life and gifts at New Life. The residencies are designed to give participants local church ministry experience, as well as a glimpse into a life in vocational ministry. Participants will gain valuable experience while working alongside New Life staff members. No problem! Just enter your information below, and we’ll notify you as soon as we post new job opportunities in the future.